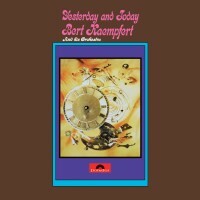 Six nostalgic hits from the Fifties and six new compositions with his own unique sound – such are the ingredients of Bert Kaempfert’s album YESTERDAY AND TODAY, recorded in November 1972 and released the following year. It was probably for this reason that MCA released this compilation in the USA under the title FABULOUS FIFTIES… AND NEW DELIGHTS. Do you remember Blueberry Hill? It was a Top Ten hit for Glenn Miller and his singer Ray Eberle in the Forties; it was a million seller for Fats Domino and his honky-tonk piano in 1956, and Louis Armstrong – who had recorded the number in 1949 – also profited from its success. And here it is again – given a decisively modern touch by Bert Kaempfert. Elvis Presley’s Love Me Tender was an overwhelming success: taken from the film of the same name (Presley’s very first film), this melody goes back to a song from the American Civil War, Aura Lee, written by George R. Poulton. Bert Kaempfert pays homage here to the “King of Rock ‘n’ Roll” with his entirely personal interpretation of this early rock ballad. The guitarist Duane Eddy had a special “trade mark” in the 1950s: a twangy guitar sound with which he introduced his rock numbers – one of these was his highly successful Rebel Rouser, performed here à la Kaempfert, which happily connects 1958 with 1972. Bert Kaempfert, of course, also has his very own “trade mark” – a remarkable versatility which allows him to take a rhythm and blues number such as Night Train (a hit for James Brown in 1962) and lend it a truly modern touch without losing anything of the original thrilling beat. If your memory functions better in the world of pop rather than rock, then two timeless melodies which have been treated with the Bert Kaempfert Sound will offer special pleasure: Who’s Sorry Now, a highly popular song in the vaudeville theatres of the 1920s, became one of Connie Francis’s greatest hits in 1958 in a modern version, and Everybody Loves Somebody. The latter song brought Frank Sinatra only moderate success at the end of the Forties but sold millions in 1964 when sung by Dean Martin, who used it as his theme melody in his television shows and made it a true classic. But maybe you prefer works by the composing team Bert Kaempfert/Herbert Rehbein such as You Turned My World Around, which Frank Sinatra included in his repertoire, or Children Of Peace, whose basic lyrical mood is spiced with dynamic, powerful sections, or again I Remember Loving You which is based on the Cancan from Jacques Offenbach’s opera “Orpheus In The Underworld”. No matter what your taste is, YESTERDAY AND TODAY, a collection of truly classic instrumental works, offers something for everyone.